In fact, I'm not sure what you see more of around town: Viking's black and red Newport Trolleys and tour buses or the local taxis and the city buses. 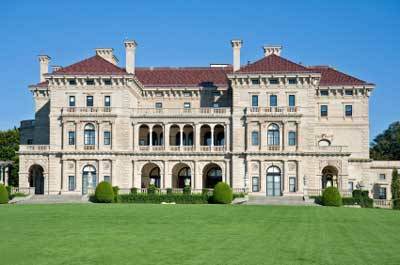 The Deluxe Newport Tour allows you to see all the sights of Tour 1, plus you can see any 2 mansions of your choice! If I had my choice, I'd go with The Breakers and Marble House. But feel free to pick whichever appeal to you more. Public tours leave from the Newport Visitor Center, 23 America’s Cup Avenue (next to the Marriott Hotel). Tickets may be purchased at the Visitor Center on the day of the tour. Groups of 20 or more may arrange for private tours by contacting the meeting and convention department. Viking Tours can handle groups of all sizes, whether your party is attending a meeting or convention in town or wants to charter a trip to New York, Cape Cod or Boston. 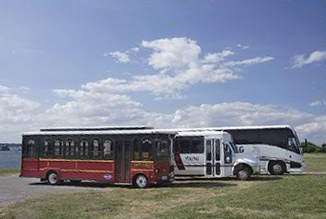 Viking Tours' fleet is ready to handle your group, with its 47-passenger motorcoaches and 24-passenger minicoaches and smaller trolleys. 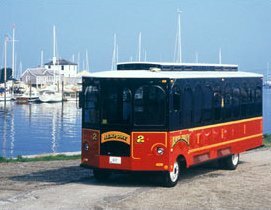 Viking's 30-passenger red and green trolleys are perfect for small groups and wedding parties to tour the historic "City by the Sea". 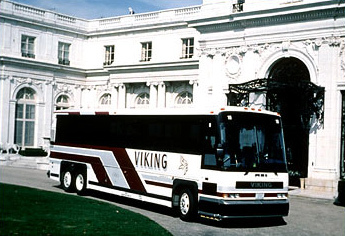 If you're visiting Newport in your own motorcoach, Viking Tours offers a number of services, including step-on tour guide service and full itinerary planning. 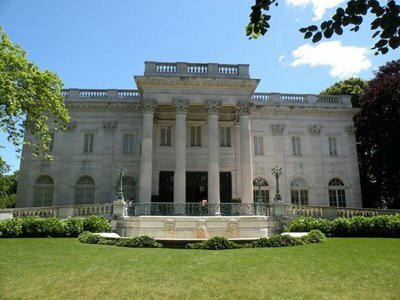 This narrated tour, which lasts about 3 hours, includes the colonial section of Newport, the breathtaking Ten-Mile Ocean Drive, Bellevue Avenue mansion area and a visit to one of the Newport mansions. This 4 hour tour also includes the Ten-Mile Ocean Drive and Bellevue Avenue mansion area, plus, you'll stop in for tea with "The" Mrs. Astor at her Beechwood mansion. 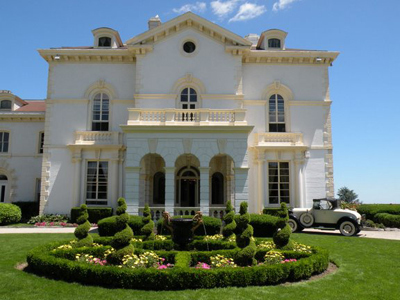 ***Note: Beechwood mansion was purchased by billionaire Oracle founder Larry Ellison, and it seems that 2010 may be the last summer that tours and events will be conducted here. 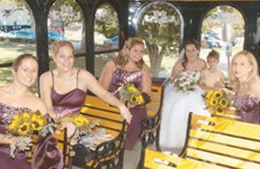 The Viking Tours Wedding Trolley is the perfect mode of transportation for your special day or even your rehearsal dinner. 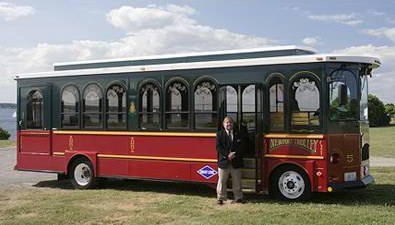 The unique and elegant red and green trolley is clean, comfortable and air-conditioned, seating 30 on its old-fashioned wooden benches. 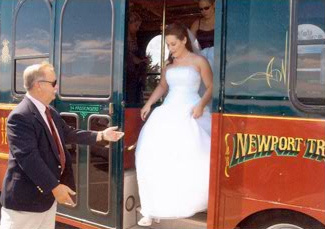 If you'd like to reserve the trolley for your wedding day, I'd advise you to book it as far in advance as possible (10-18 months). Saturdays and holiday weekends in the summer and fall are always the busiest, so plan accordingly! For more information, contact Viking Tours by filling out the form below. Check as many boxes as you wish, and someone will get back to you shortly to provide you with the information you need.